Ring binders are indispensable for schools, offices, and homes. 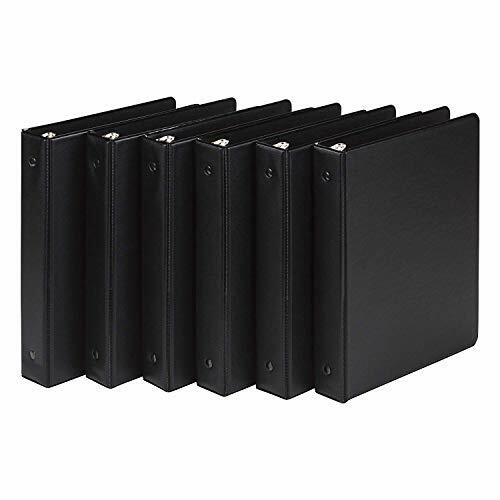 There are many binders available in market which serves the purpose; however, if you are on the lookout for a small, durable, and economical paper storage and organization solution, the black junior 3 ring storage binders are the right choice for you. Order multiple binders to create a colorful custom reference system for weekly or monthly office reports, multiple classes at school, or other unique personal or professional projects. Cover is made from strong PVC and is tightly sealed over rigid chipboard made from 100% recycled fiber with at least 75% post-consumer content. Three spine mounted mini 1 inch round rings with double boosters can hold up to 225 sheets (8.5”X 5.5” size) with ease. Also includes two clear inside horizontal pockets for additional storage and organization of loose documents and non-punched papers. Each pocket provides enough space to hold notes, photos, or business cards. The overall look and value make these great binders for school, office or even managing your personal documents at home. If you have any questions about this product by Samsill, contact us by completing and submitting the form below. If you are looking for a specif part number, please include it with your message.